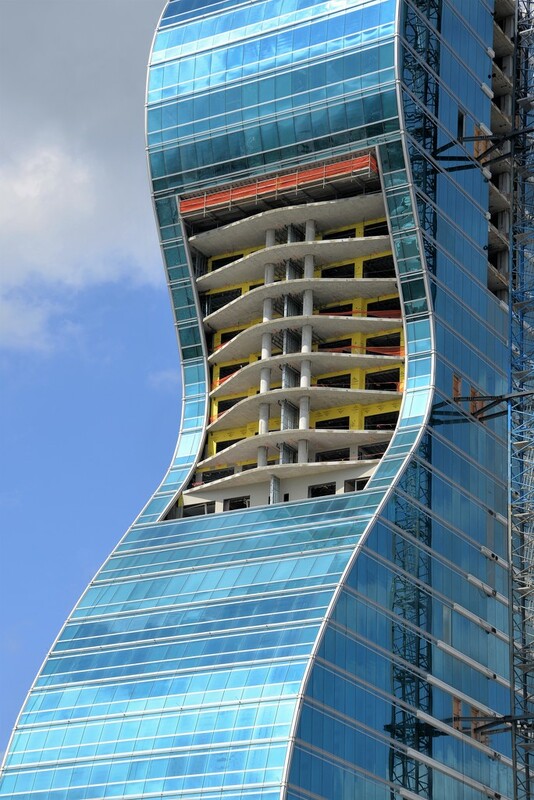 Construction continues on the new guitar-shaped hotel at the Seminole Hard Rock Hotel and Casino in Hollywood, Florida. This is taken from the opposite side from where I photographed the general construction site before. I have a friend who is a structural engineer. He says that the reason for his profession is because architects don't understand physics. This building reminds me of that comment. Awesome, that’s going to be a sight to see ! An interesting capture, although it's not my idea of beautiful architecture. Wow... what a unique structure! It makes a wonderful shot! @shannejw @tdaug80 @randystreat @sugarmuser @sunnygirl @koalagardens @momamo @onewing @fayefaye @carolmw @kork @tonygig @kwind Thank you for all the wonderful comments and for getting my photo of the new Hard Rock Hotel on the Popular page. A super shot of this impressive architecture - fav! Great capture of this unique building! Fav.